On a canoe trip in Zimbabwe, Ann Jones met British photographer Kevin Muggleton, and on a whim they decided to make an overland “expedition” from one end of Africa to the other. Their mission: to reach the southernmost tip of the continent and find the Lovedu people, a legendary tribe guided by the “feminine” principles of compromise, tolerance, generosity, and peace–a tribe once known for its use of skillful diplomacy instead of warfare, and ruled by a wise and powerful woman, a great rain-making queen named Modjadji. After rudimentary preparations, Jones and Muggleton set out from England in a 1980 powder-blue army surplus Series III Land Rover. Looking for Lovedu chronicles their adventures as they lurch through Morocco, Mauritania (where they cross the great apricot-colored expanse of the Sahara alone), Senegal, Mali, Cote d’Ivoire, Ghana, Togo, Benin, Nigeria (where they are harassed by greedy soldiers), Cameroon, Central Africa Republic, Zaire (where they bog down in endless mud), Uganda, and Kenya. Along the way they battle malaria, try to reform some would-be robbers, sing Christmas carols with American missionaries, visit the twenty-four wives of the fon of Nkwem, and confront extortionate and dangerous “Mobutu Men.” In Nairobi, Jones bails out on the speedy Muggleton and recruits a new vehicle and new companions: Australian film maker Caro Hartsbury and Kenyan Celia Muhonja. The women travel on at a more leisurely pace through Tanzania, Malawi, Mozambique, and Zimbabwe to South Africa where they at last meet Modjadji V, Queen of Lovedu. 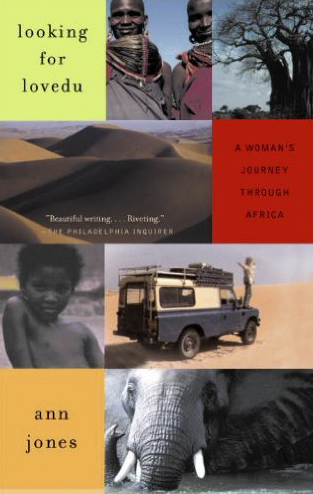 In the course of this roller-coaster ride—crowded with obstacles, beauty, maddening corruption, and remarkable people—Jones learns a lot about Africa, past and present, and one or two things about herself.